Start off your visit on the 18th (Sat): take in panoramic vistas at Qutub Minar and then don't miss a visit to Indipix Gallery. 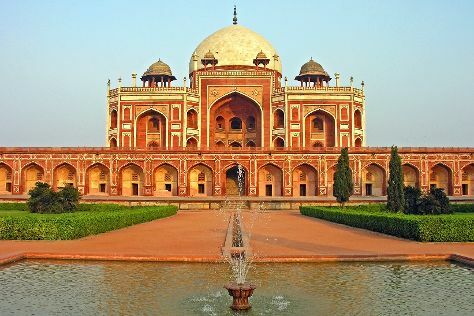 On the 19th (Sun), you'll have a packed day of sightseeing: steep yourself in history at India Gate, then don't miss a visit to Humayun's Tomb, and then take in the spiritual surroundings of Akshardham. For ratings, traveler tips, photos, and more tourist information, go to the New Delhi trip app . Mumbai to New Delhi is an approximately 4.5-hour flight. You can also take a train; or drive. When traveling from Mumbai in May, plan for somewhat warmer days and about the same nights in New Delhi: temperatures range from 47°C by day to 30°C at night. Wrap up your sightseeing on the 19th (Sun) to allow time to travel to Kullu. Kick off your visit on the 20th (Mon): contemplate in the serene atmosphere at Raghunath Temple, contemplate in the serene atmosphere at Hanogi Mata Temple, then take in the spiritual surroundings of Sharvali Devi Temple, then contemplate in the serene atmosphere at Kulant Pith, and finally contemplate in the serene atmosphere at Lord Ramchandra Temple. For where to stay, photos, maps, and other tourist information, use the Kullu trip builder tool . Explore your travel options from New Delhi to Kullu with the Route module. Finish up your sightseeing early on the 20th (Mon) so you can go by car to Manali. Start off your visit on the 21st (Tue): contemplate in the serene atmosphere at Himalaya Nyingmapa Buddhist Temple, contemplate the waterfront views at Beas River, then appreciate the views at Solang Valley, then relax and rejuvenate at some of the best spas, and finally take in the spiritual surroundings of Hidimba Devi Temple. To find more things to do, ratings, other places to visit, and tourist information, read our Manali trip itinerary maker app . Getting from Kullu to Manali by car takes about 1.5 hours. Finish up your sightseeing early on the 21st (Tue) so you can go by car to Shimla. On the 22nd (Wed), make a trip to The Ridge, take in the spiritual surroundings of Jakhu Temple, don't miss a visit to The Mall, then admire all the interesting features of Indian Institute of Advanced Study, and finally admire the striking features of Viceregal Lodge. For maps, reviews, where to stay, and tourist information, read Shimla trip tool . Traveling by car from Manali to Shimla takes 4.5 hours. Alternatively, you can take a bus. Finish your sightseeing early on the 22nd (Wed) to allow enough time to travel back home.